Las Vegas, Nevada—Sergio Pagni beat-out 23 other archers in the largest shootdown ever to take the compound open championship at the 53rd Vegas Shoot. “I feel great. At the beginning of the week, I said I was confident in my shot and I was sure I’d make a perfect 900 score. When I look back and see how many other perfect scores were in the final with me, I knew it would be a long journey,” said Pagni. Pagni used the new Superdrive 27, an arrow for archers seeking the maximum diameter scoring advantage in a lightweight all-carbon shaft. The light-mass, large OD Superdrive 27 joins Superdrive 23 and 25 to complete the lineup of large OD carbon target arrows. 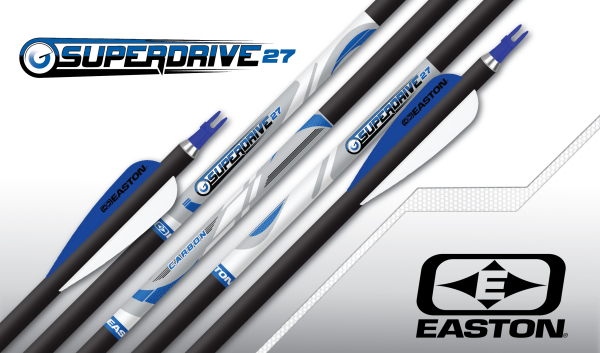 Designed specifically for tournament use, this high-perfomance shaft is made with proven Easton Superdrive all-carbon construction. The 27/64” diameter is ideal for shooters looking for the ultimate arrow at ASA/IBO 3D’s and NFAA indoor competitions. The Superdrive 27 is available in a 270 spine with the G-UNI or Super UNI nock system.